When Life Throws You Broken Bones, What Do You Do? Sometimes, when I am starting a knitting project, I have to sit down and carefully follow directions or plan out the correct sizes. Other times, I reach a point in a project that requires careful thinking. At times like these, my knitting projects can stall. Thanks goodness for dishcloths – and friends who love them! My friend recently celebrated a birthday and she truly prefers knitted or crocheted dishcloths. So this was a perfect gift to make – and perfectly mindless knitting for me. 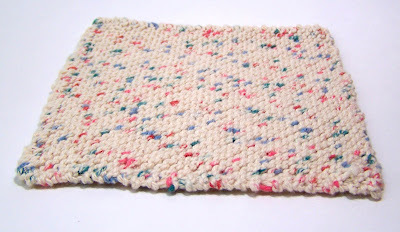 I introduced Grandma’s Favorite Dishcloth Pattern to my knitting club last year and, for many, it was the first time they completed a pattern. With that success under their belt many have ventured on to other projects. It was just the thing to get the young ladies moving. Check out this giveaway at Cleveland Handmade! Sometimes projects like that are just what soothes me! Just a simple knit knit knit can make me relax like nothing else! I hear you on that! Sometimes I need to do “mindless” knitting that does not require counting. Other times, though, I love to challenge myself.